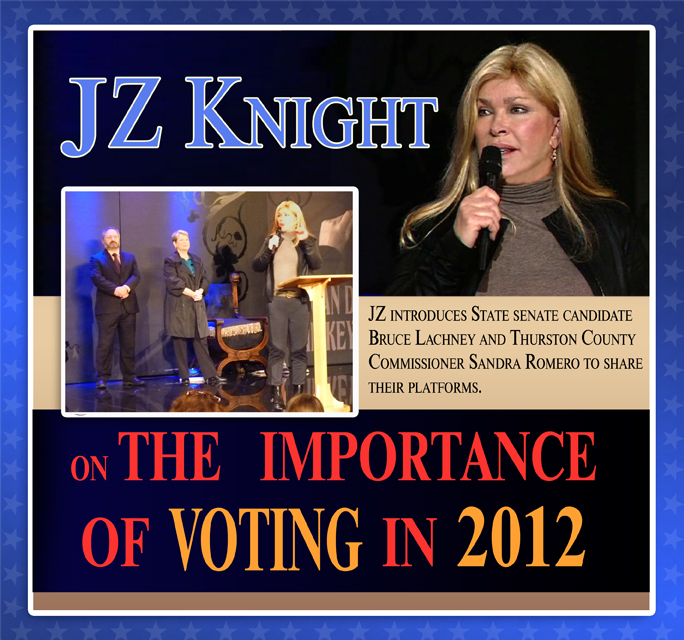 On Thursday, September 20, 2012, JZ Knight presented an empowering talk to students at Ramtha’s School of Enlightenment (RSE) and worldwide participants via live-stream in 36 countries. Knight explained why she has become a significant donor to national, state, and regional Democratic causes. She clearly explained her concerns about a variety of issues including: women’s rights, the environment, and corporate collusion with the Republican Party. Knight then introduced State Senate candidate Bruce Lachney and Thurston County Commissioner Sandra Romero to share their visions as they seek to represent this area in the November election. – get involved in your 2012 candidates from each party. – support those who will follow their platforms. – support your Democratic candidates if you agree with their platforms. – beware of the Republican threat. Knight closed by saying that the clearest path out of this quagmire is the Democratic ticket and urged everyone to register to vote. Click here to register to vote in the United States.